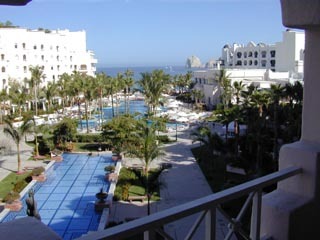 When it's time to relax, the view from our balcony makes it the perfect place to be. A chair, a book, and a margarita and it just doesn't get any better than that. 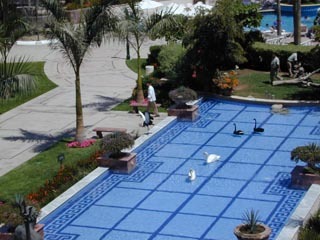 A closer view of the reflection pond shows the four swans, two white and two black. One of the two African birds has escaped the grass area where two workers are cleaning. These birds can be a little aggressive, as one picture below shows. 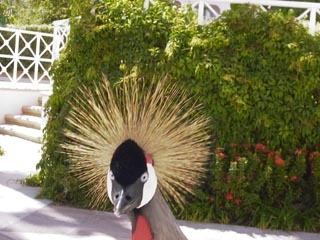 Our son Darren took this picture of an African bird one second before he (Darren) turned and ran. 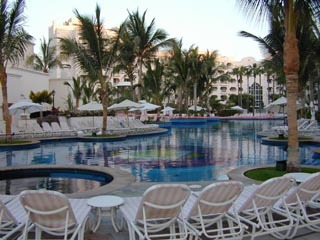 The picture on the right is taken from the beach looking towards our room at Pueblo Bonito. 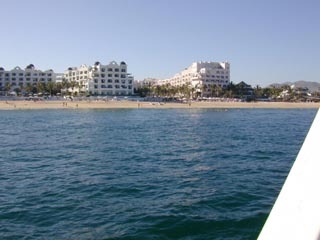 This picture of the Pueblo Bonito was taken during a sunset cruise. 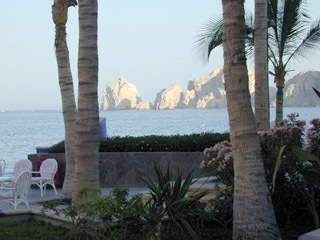 The picture of "Lands End" was taken from the restaurant terrace.